Scribes Are Back, Helping Doctors Tackle Electronic Medical Records : Shots - Health News In ancient times scribes were used to record everything from prayers to legal transactions. Now they're making a comeback in the doctor's office, easing the transition to electronic medical records. Medical scribe Connie Gayton keeps the electronic records, allowing orthopedic surgeon Devesh Ramnath to focus on his patients. Like many other doctors across the country, Dr. Devesh Ramnath, a Dallas orthopedic surgeon, recently made the switch from paper to electronic medical records. This meant he no longer had to just take notes when he was examining a patient — he also had to put those notes into the computer as a permanent record. "I was really focused on just trying to get the information in, and not really focusing on the patient anymore," Ramnath says. In fact, he found he was spending an extra two to three hours every clinic just on electronic records. So he hired medical scribe Connie Gaylan. Acting a bit like a court reporter, Gaylan shadows Ramnath at every appointment. As the doctor examines a patient, Gaylan sits quietly in the corner, typing notes and speaking into a handheld microphone. Once she's finished with the records, she gives them to Ramnath to check and approve, saving him hours of administrative work and allowing him to concentrate on his patients. "I would more than happily sacrifice a significant chunk of my income for the improved quality of life I have," Ramnath says. Medical scribes are in high demand nationally. Any doctor who doesn't make the switch from paper to electronic records by 2015 will face Medicare penalties, and this deadline is fueling the demand. 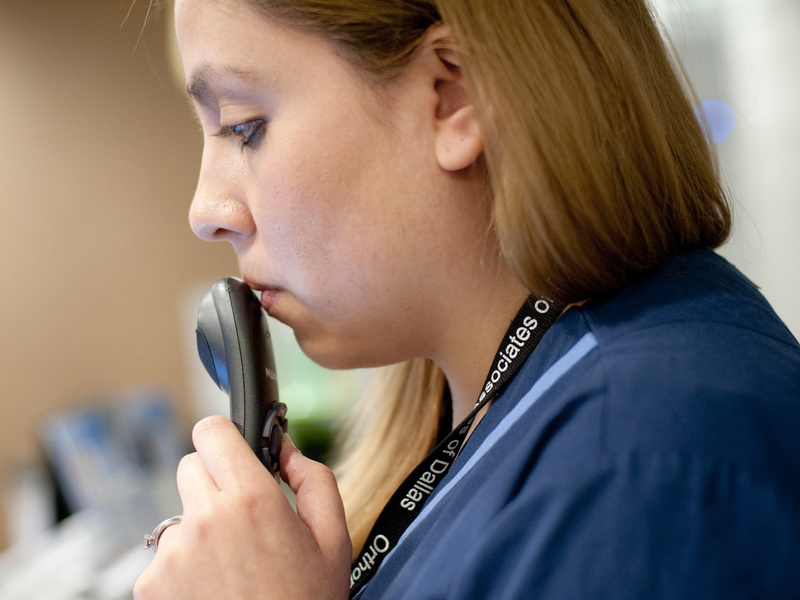 As the doctor examines a patient, medical scribe Connie Gayton records the visit using a microhone tethered to her laptop. PhysAssist, the country's first scribe staffing company, is on the second expansion of its Fort Worth, Texas, headquarters and has opened another office in Chicago. Alex Geesbreght, the company's CEO, says the firm is growing by 46 to 50 percent every year. In 2008, PhysAssist had 35 scribes; now it has 1,400. The other big scribing companies — Medical Scribe Systems and Scribe America — each have thousands more, and the demand keeps growing. PhysAssist trains scribes from across the country every week in its Fort Worth mock emergency department, where instructor Brandon Torres shows students the right way to fill out an electronic medical record. There are thousands of record systems, and scribes need to know how to put in the right billing codes and medical terminology at lightning speed. Torres says it's important not just to be able to multitask, but also to be able to listen to multiple things at the same time. "You're listening to the physician, you're listening to the nurse, you're listening to the patient," Torres says. "And you're gathering all that information and presenting it back to the physician." That last part's crucial. The physician has to approve the scribe's notes, because ultimately the doctor is responsible for the record. Medical scribes make $8 to $16 an hour. Many of them are medical students who say they find it an invaluable experience. But it's not clear that scribes make things better for patients. Dr. Ann O'Malley with Mathematica Policy Research in Washington, D.C., points to one study done in an emergency department in New Jersey that found that doctors with scribes were able to see more patients on average — which means more money for the institution. But that same study found that the amount of time a patient spent in the emergency department didn't decrease. Medical scribing also raises some privacy concerns, O'Malley says. Some patients may not like having an extra person in the exam room.